Ergonomic HG Desktop Monitor Mount Arms are the most versatile set; featuring a wide range of easy one touch adjustments with no buttons, knobs, levers, or switches. Use just one hand to adjust tilt, swivel, and pan range. Spring-loaded joints ensure the arms stay in place, yet are easily repositionable. Arms save valuable desktop space while providing full adjustment for ergonomic viewing and accessibility. One arm included. Dual-jointed arms feature 95° of tilt adjustment. 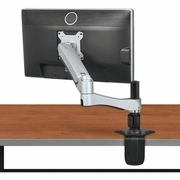 Monitor mount joint features 180° of swivel and 110° of tilt adjustment. A full 360° of rotation adjustment allows you to fix your monitor(s) in either landscape or portrait orientation. Each arm holds a monitor up to 24" and 22 lbs. VESA compatible mounting in 75mm x 75mm or 100mm x 100mm mounting patterns. Arm locks securely onto your desktop with a clamp mechanism that adjusts to accommodate desktops from .5" to 1.96" thick.